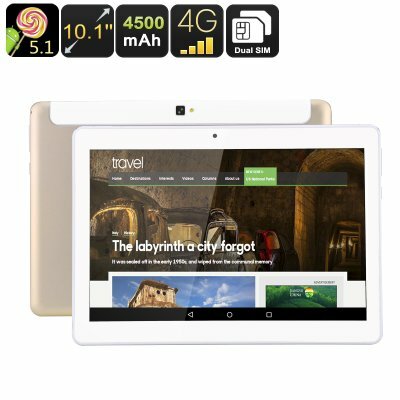 Successfully Added 10.1 Inch Tablet PC - Quad Core CPU, Dual SIM 4G, Android 5.1, OTG, 16GB Memory, 4500mAh Battery to your Shopping Cart. This 10.1 Inch 4G tablet proves you don't need to spend a fortune to get a quality computer experience on the go. What it lacks in original design it more than makes up for with features and affordability. Brining 2G, 3G and 4G network support across a spectrum of frequencies this 10.1 inch tablet lets you enjoy unparallel cellular data connectivity so even when there is no Wi-Fi networks around you can still enjoy super fast download speeds - quick enough for you to stream HD movies or watch the latest sports games direct to the tablet without lag. Using a quad core MTK6735 CPU and having a Mali-T720 GPU for enhanced graphic support allows this tablet to handle a host of games without dropping frames or lag. Running on the Android 5.1 OS ensures great compatibility and access to the widest range of apps, games and streaming services. you'll have plenty of storage space with the 16GB of onboard memory that can easily be added to via the micro SD card slot. A 4500mAh battery brings you plenty of usage time to enjoy all these features so with this 4G tablet PC by your side you are all set for the daily commute or keeping everyone entertained on long journeys or road trips. This 4G Android Tablet PC comes with a 12 months warranty, brought to you by the leader in electronic devices as well as wholesale Android Tablet PCs.. The Tablet PC is ok, even shipping has been pretty fast.